Single? In a relationship? Married? No problem! 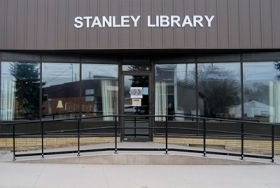 Beginning January 23, stop at the Stanley Public Library and have a blind date with a book. All you need to do is check out a book on display. The eclectic assortment of books from a variety of genres will be wrapped so you won’t know the identity of your blind date until you get it home. Will it be fiction, nonfiction, funny, informative or heart-breaking? There is a chance you could be disappointed, but you may have fun reading something you may have never ventured to read. Inside each book is a “Rate Your Date” sheet. Fill out the sheet and return it to the library. Don’t worry if you thought the book was a dud; your completed sheet enters you in a drawing for a prize! The sheets must be returned by February 26 and the drawing will be February 28. The “Blind Date with a Book” event is open to patrons ages 16 and older and is sponsored by the Friends of the Library.